Originating in the womb of Mother Jord, from deep inside the Earth, crystals are the keys to her living energy and ultimately keys to align ourselves with our Mother again. Each crystal represents different aspects of her, vibrates on a different frequency and – just like a regular key – only unlocks specific doors. Crystals are used to activate the own inert healing energies in peoples’ or animals’ bodies, minds and spirits, in meditation, for protection, to purify water, your home, workspace or even yourself, to help channel the right energies in rituals as well as dozens of other things. Now, the term “healing with crystals” is actually quite misleading. Like most things in nature they themselves do not heal, they activate our own inert healing energies by helping us realign with (our own) nature. Unfortunately, it has become popular to advise people to just pick any crystal they feel is the right one for them and their specific problem. Especially in New Age the emphasis is on emotions and whims, rather than based on actual (Pagan) knowledge as acquired over the centuries and a holistic approach in which emotion (spirit/soul) is included, but not the foundation of healing. 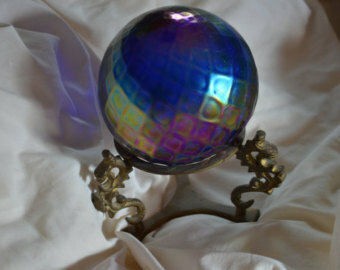 You cannot do harm by using a crystal vibrating on a completely different level than what you would require to activate your healing energies, but you could as well pick a glas pearl or plastic stone – it will simply not do anything in terms of solving your problem. 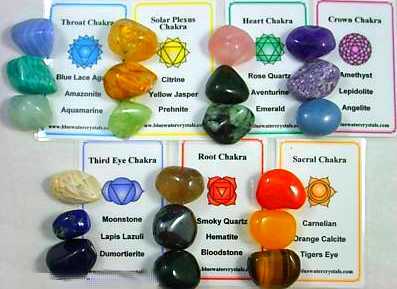 In order to learn to reliable identify the source of your being unwell I strongly recommend acquiring not one but several reliable books on Crystals, Crystal Healing and Chakras. Study them and experiment with crystals, lower and higher frequency crystals and crystal combinations yourself on a regular basis. 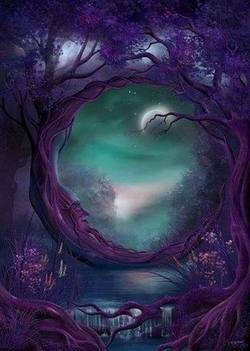 If you are a witch or Wiccan you may write your observations down in your Book of Shadows, as a Pagan or Heathen do keep some kind of written record of your experiences. In other words it helps if you don’t only check your private library every once in a blue moon when you are actually ill or unwell. Frequent study will give you more security in identifying the remedy required and trust in your choice. You may find that one author suggests the Amethyst to regain clarity while another recommends Rock Crystal and get confused or start doubting your choice once you picked a stone. (Self-)Doubt does not have any one particular frequency, doubt vibrates on all frequencies, blocking you further and inhibiting the activation of your healing powers. But if you knew that the Amethyst (Greek ametusthos: “not intoxicated”) was especially helpful in assisting you regain clarity in the matters concerning the mind, that it helps still the mind and keep outer influences or energies at bay (and in that way connects you to your higher/true self as well) then maybe you could already make an informed choice. Even the better if you knew the legend of this stone in different cultures, especially the Greek one appears to be of significance here. On the other hand Rock Crystal, a “cold” stone, rigid-looking as ice, is the symbol of chastity, purity of thoughts, innocence, modesty and fidelity and may help reduce stress caused by brooding as well as help reduce headaches, migraine, fevers (on a side-note it does quite a lot of other things not related to the mind/clarity as well). In this context it would be easy to discern between the different kinds of clarity and choose the crystal right for your uses. If you were a student seeking help with concentration, Amethyst would be the way to go, and I recommend combining it with Rainbow Fluoride. Keep them both on your desk and in your book back close to your study material! Meditate with them resting on your crown or third eye Chakra, use them in a ritual, rededicating yourself to your purpose. This was a rather simple example in that it only pertained to one level, the mind. However, the more your Chakras, Meridians or energy points are clogged the more overwhelming on an emotional and even physical level your problem or illness may become. So. If your psychosomatic problem is already physically perceptible you will have to treat it on more than one level. Now you have a pressing throat-ache, frog in your throat, a constricted feeling around your neck. 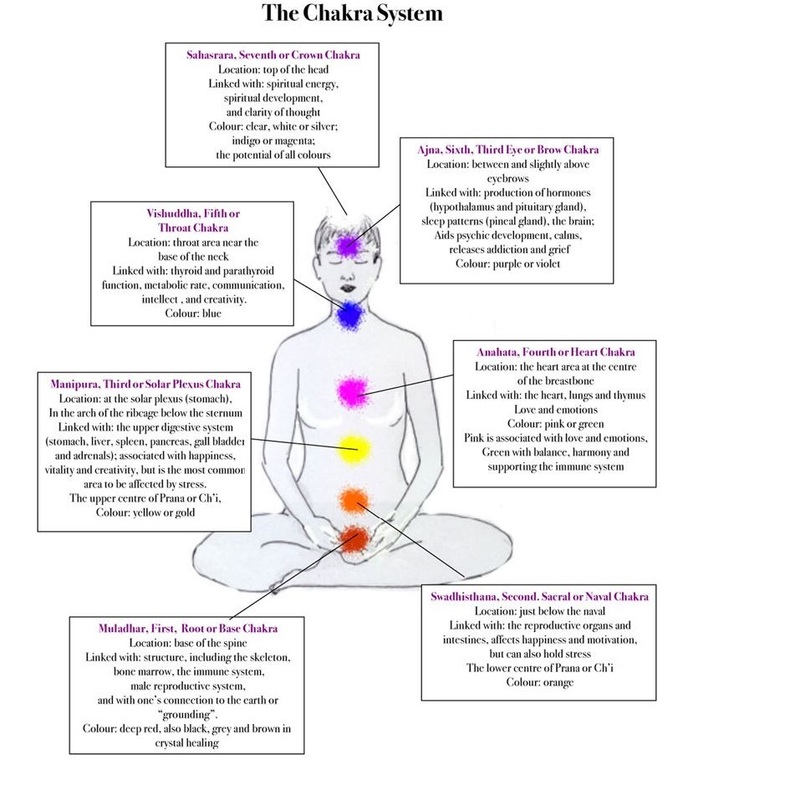 If you ignore this long enough you may have to deal with psychosomatic (“stress-related”) asthma attacks, you might find yourself getting colds or bronchitis more frequently and chances are that the unreleased energy will keep building and then spreading to the other Chakras, clogging you completely and causing you severe chronic illness. If you do not listen to your spirit and mind, then your body will tell you exactly what is wrong, and it will increase the pressure for you to act by giving you more and more alarm signals. This is, essentially, a beautiful thing if you think about it. There are different methods on where to place the Crystals. Some place them on the according Chakra, on the body part that hurts, some just meditate over them, and so forth. In this case what feels right is exactly what is right (for you). If your health problems have either become severe on a physical level or are solely physical in nature I think it ought to be “crystal clear” *wink wink* that working with crystals, gems and stones alone will not be the answer here! Crystals, on the other hand, are a global phenomenon and they were known and used in every ancient culture, so combining them with other forms of healing such as (either) homeopathy, acupuncture, acupressure, Meridian therapy, Chakra healing, Schüssler salts, Bachblüten therapy or naturopathy (herbs, essential oils, teas) in general work very well empirically. 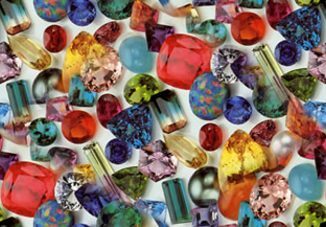 If you have identified the right stone for your current problem you may get confused that it comes in different colors or rather types. Tourmaline is such a crystal. Generally speaking it helps with change. A black Tourmaline deflects negative energy (protective) and helps you focus on the positive aspects of the change, a green one may stabilize your emotions during this turbulent time, the different kinds of red Tourmaline all work in different ways in terms of change as well. After obtaining a crystal, either by buying it, finding it or having received it as a gift, you should clean it immediately. Just as the crystal’s energies can cause a reaction in you, it works the other way around as well. Crystals take on the general life energy of the person using or touching it, that counts for both positive as well as negative, healthy and sick energy. For them to “work as new” they need to be cleaned before use. Now, there’s a lot of hysteria regarding lending your crystals to others, which mainly derives from uninformed New Age superstition. – Anything (!) alive in this universe can be cleansed and restored to its original state again, energetically and spiritually speaking. From person to situation to object, anything can be “healed” and be returned to its original spiritual state. And that is after all, how Crystals themselves work, on a spiritual level. 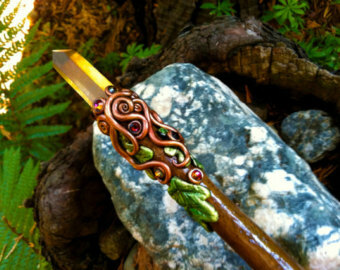 They may cause physical or emotional reactions as a chain reaction to activating your inner healer, to reawakening your spirit and reconnecting you to Mother Earth. They are essentially a spiritual tool. Now granted, I personally wouldn’t lend my Crystals to someone I dislike, but that is less of a spiritual and more of a psychological thing, because knowing this person touched “my” Crystals would make me feel uncomfortable and probably always remain in the back of my head. Which would in turn not be very conductive to my own Crystal work. If you go to a healer check if he/she actually really cleaned the Crystals! Some healers clean them in front of their charges, which is probably the best option. Especially the gentler ways of healing attract many charlatans for some reason and inexperienced people may fall for their routines. There are different ways of cleaning your Crystal and revitalizing it. The simplest probably being rinsing it under luke-warm to slightly cool water. Knowing when the crystal has been rinsed of excess/foreign energies is another matter of experience. I personally can hear the vibration of the crystal. One with a lot of foreign energies clinging to it sounds “heavy”, it is a dark-pitched tone/hum/vibration. The cleaner and ultimately cleaner the crystals gets, the higher-pitched its vibration. Whereas – again – different stones have different vibrations, so an Obsidian has a different “tone” than rose quartz for example. It all depends on experience. This is also why I recommend rinsing crystals one by one and not in bulks! Maybe you will not hear a tone or the vibrations but find a different way of knowing when your crystals are clean. If a Crystal breaks during or after rinsing, do not use the broken parts anymore. Dispose of them (in gratitude). It is not just the Crystal that is broken (“dead”), but the energy. 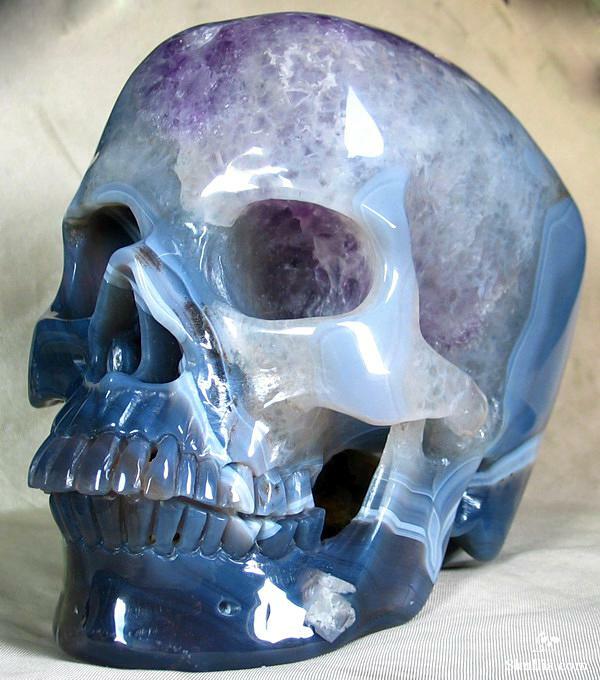 Nothing lasts forever, don’t force it, just buy a new Crystal. There are different opinions on this, but I only clean my Crystals when I need them nowadays. 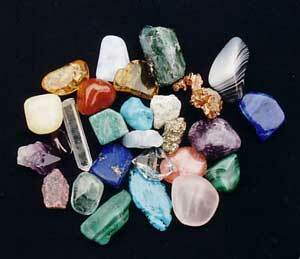 Otherwise the high and mixed energy of the Crystals can get intense, depending on the size of one’s collection. You, your family or pets might suddenly appear like they have ADHD and have trouble falling or staying asleep, because of all the great positive energy coursing through your house. A friend of mine doesn’t just protect her house but spiritually cleans it every week, which includes all items in the house. Another friend says she can’t raise enough energy in order to do that, protecting and shielding is all she can do, the rest – like cleaning crystals – she has to do manually. My point is: don’t think you are less powerful than someone who can raise more energy of a certain type; you are your unique Gods-created self and have different talents and abilities. There is a reason the Gods gave us each the set of skills, abilities and interests they did. Don’t try to be someone else, just go with your flow. If you are amongst those that prefer to clean their Crystals regularly for religious, spiritual reason or because you use them frequently I recommend keeping your collection in an energy-blocking box and out of your bedroom. I sometimes put one or two Crystals on my bedside table when I have trouble sleeping, but this is a deliberate choice with specific energies, so still a big difference. Except for rinsing them under running water you can also clean and charge your Crystals with the light of the full moon. Keep them on the windowsill during the three nights of pre-, full and post full moon. During the day, wrap them in a cloth and keep them from the sun. 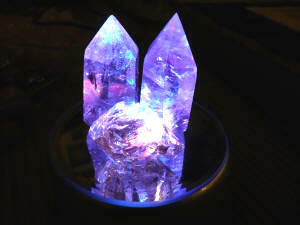 You may choose to put your Crystals in a bowl of salt water (approx. 3 tea spoons to a quart work well for me personally usually, depending on the size of the Crystal) and let them sit for 3-9 hours. On the contrary to the rinsing technique you can put several crystals into the salt water. 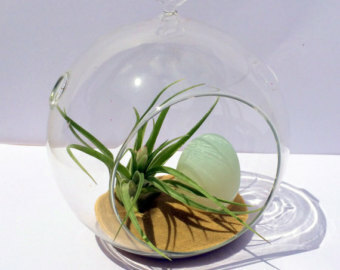 You can energize your plants with Crystals, but to be quite frank with you, I do not possess enough qualified knowledge on the exact techniques or how-to’s. I am not good with potted plants, have none at home and thus have no idea how to energize them hence. You cannot only energize drinking water but also bath water for example. Please note that Crystals do not clean physically contaminated water! They do not kill off germs and bacteria. Let’s remember that Crystals help unclog and boost natural energy, they are not disinfectants or have the same effect such as chemicals (“medicine”). They have no “killing” properties. 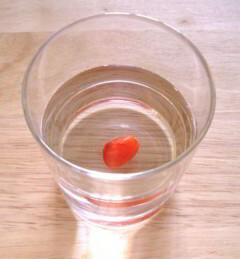 In order to energize water leave the Crystal(s) in it for 3-9 hours. You can meditate over a Crystal, meaning if you have read about it, try to see, feel and be the Crystal, try to understand it inside out, hold an image of it in your inner eye or stare at it while trying to connect with it. If you are meditating in combination with Chakra-clearing you may place a Crystal on the according Chakra and meditate until you move on to the next. 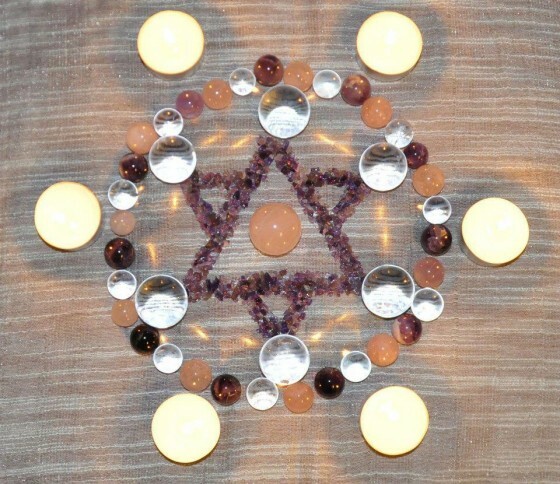 You may build a little circle of Crystals around you or find a different way that works for you. 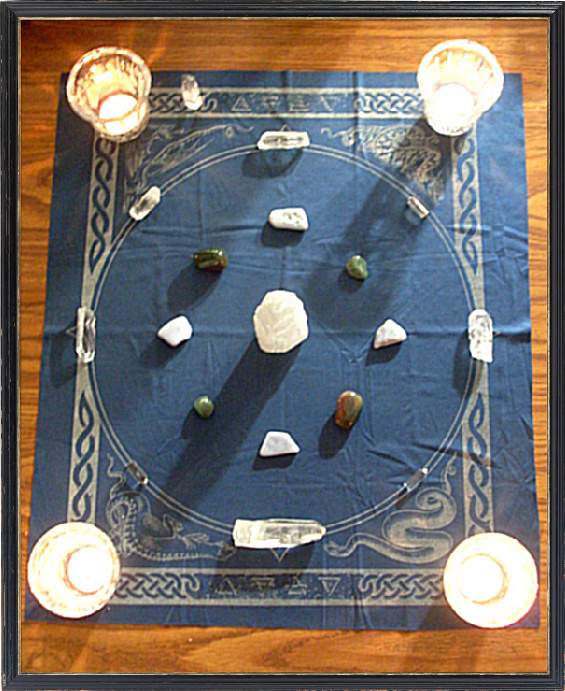 Some people use Crystals instead of Candles in order to mark their Sacred Circle or they use them to motivate certain energies, elementals, deities to come aid them in their magical work. Some just use a Crystal instead of a bowl of earth or salt to represent the element of earth. I’m sure there are several other ways of using Crystals I haven’t even thought of right now or that I either don’t know or just don’t personally appreciate. This was only a short introduction and I recommend not relying on my personal experiences and opinions solely. My tradition is of course influencing my views and methods and if you follow a different path you might also need to focus on different things. I can’t stress this enough: read, read, read and practice makes perfect!